Most of us cherish the value of hospitality, but when it comes to a mouse (or rather mice) in the house we do well to draw the line. Sometimes it takes a while to realize that your home has been invaded but soon the telltale signs become impossible to ignore: the gnawed off corners of cereal boxes and other food containers, the little droppings, the tiny scratching and squeaking sounds. Finally you decide it is time to take action. You could go the traditional snap trap route – but then we all know the stories of the missing cheese and the unsprung trap. So, you might like to consider your options among the creative and varied array of homemade mouse traps. The following two questions and answers will help you decide on your best options as you wage war on the mice in your house: how many mice are you up against, and do you want them dead or alive? Once you have your answers, go through the list and learn how to make a trap that will catch them. How many mice are you up against? Of course you won’t know an exact number but you should be able to tell if there are just a few or a whole hoard. Perhaps your holiday cottage in the country has been standing empty for a while and now it is overrun with mice. Or perhaps it’s at home where you live permanently and have now become aware of the unwelcome rodent company. Either way, your answer to the above question would determine whether you choose a diy mouse trap which catches only one mouse at a time and then needs to be reset, or a diy mouse trap which can catch many mice without being reset. These traps will work great if you only need to catch one at a time. Of course, they are more than capable of catching multiple mice (except maybe the glass and coin trap). The plastic bottle trap involves taking an empty 2L plastic soda bottle and cutting it off just above the label. Then turn the cut-off piece over, insert it into the bottom section and tape the two pieces together, forming a kind of funnel into the bottle below. Position the bottle next to a shelf where the mouse can easily reach it, and place some bait (peanut butter, cereal crumbs or grated cheese) around the edges of the funnel. Make sure you prop something firm around the base of the bottle (like a towel or some cans) so that it doesn’t tip over when the mouse drops in. The glass and coin trap is where you take an ordinary drinking glass and place some peanut butter inside, on the edges and at the top. Then you balance one edge of the glass on a coin. When the mouse is nibbling on the bait it will bump the coin away and then the glass will drop, trapping the mouse inside. 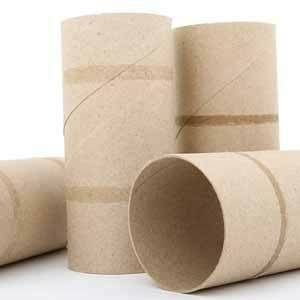 Empty toilet paper tubes like these are great for making mouse traps. One of the simplest homemade mouse traps is the cardboard tube. This is where you take the inside of a toilet roll (or a foil or kitchen towel roll if you want a longer one). Flatten the tube on the bottom edge so that it sits securely on a flat surface. Place some peanut butter on one end and then position the tube on your kitchen table or counter top so that the end with the peanut butter is sticking over the edge. Place a large plastic container (such as a garbage can or a 5 gallon bucket) directly below the tube. When the mouse runs down the tube to get the peanut butter, the tube will flip over and deposit both tube and mouse into the container below. If you need to catch more than one, you’ll want to use the cardboard tube trap mentioned above. Otherwise the 5 gallon bucket mouse trap also works great for capturing multiple mice. If you have a heavy infestation of mice, one of the best methods would be to use the spinning cylinder, or 5 gallon bucket mouse trap. You would take a cylindrical object such as an empty can, make holes on the ends and insert a wire through the can. Attach the wire across the top of a 5 gallon bucket so that the can is able to rotate freely. Now smear peanut butter, or other popular mice baits over the can. Place a ramp up to the edge of the mouse bucket trap. When the mouse runs onto the cylinder it will spin around and neatly drop the mouse into the mouse trap bucket below. And the great part is that you do not have to reset this trap before the next mouse comes along, so you could be rewarded with a considerable harvest of mice in one single setting. A variation on the mouse bucket trap above would be to use a paper plate instead of a can. You would need to skewer the plate off-centre across the top of the bucket with some bait on the plate. When the mouse steps onto the plate it will tip over and the mouse will land at the bottom of the bucket. Do You Want Them Dead or Alive? Once you have experienced the triumph of actually capturing a mouse in your trap, then the next question is how you are going to dispose of it (or them)? This is where you need to decide upfront if you want your end result to be a living mouse or a dead mouse? With reference to the above methods, if you use the plastic bottle and glass and coin traps, you will no doubt find a living mouse. With the bucket or trash can methods, you have the option of leaving the bucket empty (if you want a living mouse) or placing some kind of liquid in the bucket if you prefer a drowned mouse. When it comes to finding a way to catch your unwelcome rodent ‘visitors’ the benefits of homemade mouse traps are considerable. Firstly it’s more fun to put something together yourself and then experience the thrill of being rewarded with a catch. Secondly, it is more economical as you can mostly use basic stuff which you already have lying around your house. Thirdly and more importantly it is probably the most effective method of reaching your goal of living in a mice-free zone, as you will no doubt find when you discover the ideal option which works best in your home.